SESAC has announced a new partnership with INgrooves a leading provider of digital distribution, marketing and promotion services to the global music & video community via its One Digital platform. 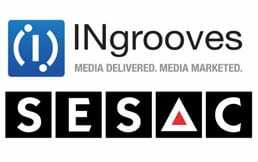 INgrooves will service SESAC-represented content to online retailers, mobile carriers, and other digital media outlets. Through this relationship, SESAC will now be able to service content, for which publishing and master rights are owned by its affiliated artists and songwriters, to INgrooves’s list of over 500 online and mobile destinations worldwide. SESAC’s utilization of the One Digital end-to-end digital asset management platform, made possible by the arrangement, automates many distribution and administrative functions for SESAC artists and connects them directly to leading online and mobile stores worldwide. In addition, the partnership provides clients customized marketing, promotion, and administrative support to help maximize the earnings potential of specific music releases and catalogues. According to SESAC, the deal signifies an evolution in its digital strategy. While licensing and royalty accounting remain core competencies, new value-add services such as digital delivery and distribution will augment opportunities for licensing SESAC-represented content in the marketplace.